I think Edmonton's is awesome. Tampa looks too much like if the Maple Leafs and Red Wings had a child. Nashville's are better than what they've been wearing, but that's not saying much at all.. I think they're terrible. And the Kings jersey is just plain boring. No colour at all! The pacific is already the blackest/colourless division in the league! Why make it worse? Nahsville's is the best imo. They really incorporated their city nicely. The collar and guitar pic is awesome. 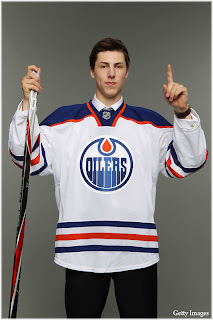 What's so cool about the Oilers jersey? The Tampa jersey looks like some alien logo. Good on Nashville for thinking outside the box....and the gold is nice; the last time they went with a yellow-like color on the spectrum, they ended up with mustard! TB's is so simple and beautiful; their franchise understands making jerseys. The Kings are nice...unfortunately, for once I have reason to compliment dastardly Los Angeles. The road version of nearly all jerseys tends to be the nicer one...alternate jerseys again League-wide! In the end, it's all subjective but I couldn't disagree more with you. I think the webbed D is decent and is certainly better than a lot of logos in the league. The main uniform set is a bit plain and the wordmark isn't as strong a crest logo as the D, I'll admit but I think it could be much much worse.. Look at the Stars, the threads Nashville just ditched, BOLTS and SENS for evidence. Plus, I'm sorta glad we haven't jumped on the whole vintage bandwagon. The vintage white colour Minnesota and Phoenix are using reminds me of how my puke looks after 8 beers and 4 glasses of whisky. I'm torn on the Tampa Bay ones. The whites are nice. The blue on it has a nice sheen that adds something. But the darks just seem bland without it. I have a similar problem with the Nashville jerseys. The whites look good, but the darks just seem to blend together and it looks a bit boring. I actually like Anaheim's regulars. Nothing spectacular while not being terrible. I definitely do not like the new Nashville home colors. I know it's supposed to be gold, but it looks like a poo-stain mustard in my eyes. The inside collar is a nice touch though, that's actually pretty neat. The Kings look good. I do like that one. For the Bolts, I'm neutral. It neither wow's nor repulses me. 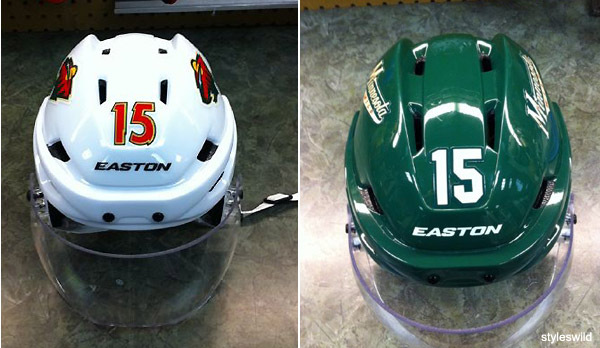 What do Ducks fans think of these? Not to get off-topic, but that doesn't look like Sidney Crosby! Now that you mention it, I can't see the resemblence at all! Islanders' are hideous, but definitely agree on Toronto and Montreal. And I would say too many light blue lines on the Pens jersey. The logo has got to be screaming about personal space violation. 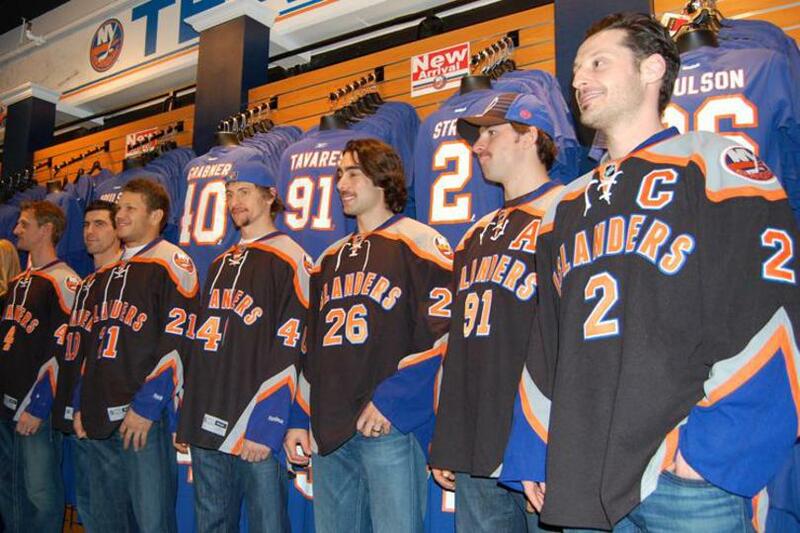 Islanders jersey is absolutely disgusting! Worst combination of colors I've ever seen on a hockey jersey, I hope they don't actually use those..
Agree on the Leafs and Ottawa ones though. Great jerseys. I am going to agree with everyone else here. Ottawa and Toronto have two great sweaters. The same can't be said for New York. They got it right the first time when they entered the NHL. The Islanders first and current jerseys are classics. The rest, not so much. Their track record when it comes to designing jerseys is probably worse than ours. I'd take Wild Wing bursting through the ice over a fisherman who looks like he deserves to be on a salmon package with the late 60's LSD striping and colors and unintelligible font. While their new alternate is nowhere near as bad as that rebrand, I think it's still hideous. 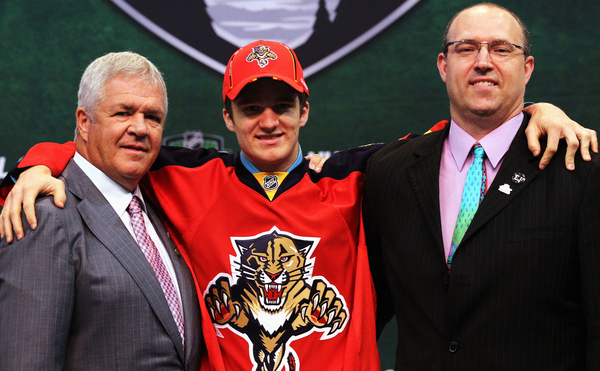 I like the Florida Panthers Jersey. 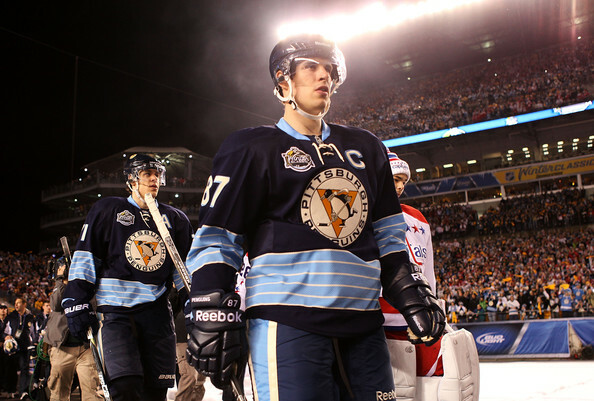 Pittsburgh's jersey is awful as I still like the retro baby blue one best. I hate to say it but I like this Kings jersey in white. I hated their purple trimmed crown ones. No style just like the team. As for the rest of them, I have really no opinion athough the piano key collar is nice on the Preds. Too bad you can't see it as it is inside the jersey. Article about the new Jets jerseys. What's with Reebok changing from having their logo on every jersey to just a plain "Reebok" script? It's a small change in detail but unnecessary and looked better before in my opinion. Regardless, here's some real photo's of the mock-ups I posted earlier..
Love the English/French shoulder patches. Makes sense seeing as how Ottawa is quite the bilingual city..
Not much to say about this except that it looks awesome. Seems as if there weren't enough numbers on an NHL uniform, since the league is mandating players numbers on the front of helmets once the regular season starts.. Interesting approach to say the least.. Ugliest jerseys in the NHL. Philadelphia's new Winter Classic jerseys. I think it's cool that they chose to make a completely new sweater instead of borrowing from their past. Although I still think this whole "vintage white" epidemic needs to go away as fast as possible. New York Rangers set to unveil their Winter Classic uniforms tomorrow. Pretty nice. I would've liked the Quakers jerseys; that would be pretty educational and a nifty throwback. But eh, I don't work in marketing so that probably wouldn't fly(ers, lol). Like the design. However, not so keen on the cream color.